Recessed aluminium entrance mat for building foyer, carpet wiper strips remove dirt and moisture from incoming pedestrian traffic | Architectural and Commercial mats | Aluminum entry matting systems Australia. Entrance mats for Hotels, schools, shopping centres, buildings, airports, hospitals. Entrance matting system suitable for high traffic locations. Entrance mat that remove/ prevent spoilage material and moisture from entering inside building. Suitable for: Commercial buildings, shopping centers, airports, schools, hospitals, hotels, aged care facilities, high traffic building entrances. Excellent value recessed aluminium building entrance mat. UV stabilised carpet: Anthracite, grey, brown, red, jet black. Support Chassis: Clear anodised 6063 T5 aluminium. 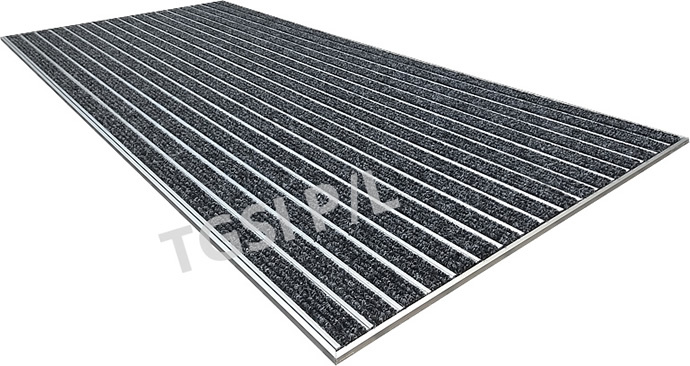 Tread surface type: 28mm wide (exposed top) UV stabilised carpet, noise proof, slip resistant, moisture/ corrosion resistant. Dimensions: 3.5LM lengths, width: no restriction, 9mm depth (aluminium profile + rubber backing), 13.5mm depth (aluminium profile + rubber backing + carpet pile). Install in 9-10mm deep frame well/ set down. Frame well system (outer perimeter): Clear anodised 6063 T5 aluminium. 3.5LM lengths. See section below for more details. Perimeter frame fixed to perimeter of set down/ frame well, or optionally be fixed direct to mat. Application: High traffic pedestrian areas. Hotels, office, school, shopping centres etc. Backing: Noise suppressing rubber sheet. Note: Interlocking design enables easy removal (lift away from framed recess) for cleaning purposes. 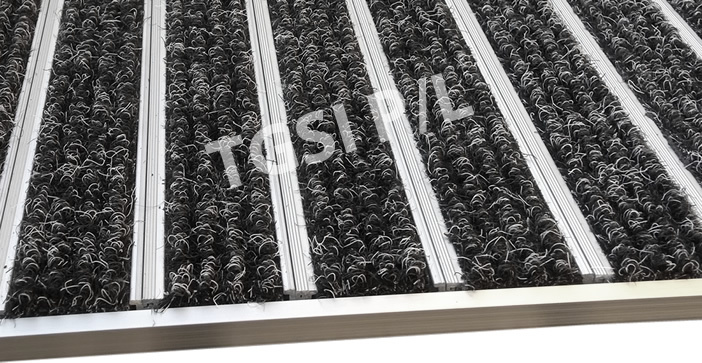 Economical, good quality economical aluminium building entrance mat system. Assists in dirt and moisture removal from incoming pedestrian traffic. Unit Pricing: Based on minimum order of 3.5LM X 1.0LM section or 3.5 SQM. Includes: aluminium profile (27 X 3.5LM lengths), carpet strip (27 X 3.5LM lengths), rubber backing, aluminium perimeter frame (3 X 3.0 LM lengths). Pricing: $850.00 + GST. Note: several mats can be made from MOQ of 3.5LM X 1.0LM (additional frame can be provided on request). Recessed aluminium building entrance mat system with perimeter frame. Anthracite carpet color shown below. Red, brown, grey color carpet wiper strip options for aluminium based recessed building entrance mat. Side view without perimeter frame. Material: Clear anodised 6063 T5 aluminium. Application: Installed at perimeter of frame well, or optionally fixed direct to mat. Note: Supplied with entrance mat.